An aircraft can't go anywhere without its legs. Landing gear are an integral part of the whole operation, yet their overhaul and inspections are more often viewed as something that is taken care of behind-the-scenes; scheduled alongside, but taking a backseat to, a major airframe inspection. Yet, it can have a huge impact on the entire project's schedule if the restoration runs into major squawks. So who’s taking care of your aircraft’s legs? Although landing gear overhaul and repair services are not available from everyone from coast-to-coast, it has a bit of a reputation of being a commodity in the business aviation industry. There are almost too many choices on where to send your gear when it comes time for inspection. It is fair to think with FAA regulations, Chapter 5 requirements, and access to the same maintenance manuals, that all facilities are equal. You would be wrong. In reality, landing gear overhauls are not created equal, and there are often many differences among the maintenance facilities and the quality of work performed, and out-the-door price. So how do you decide? Let’s begin with what’s most important to you. Video: View the entire process of a 192-month inspection of a Challenger 604 landing gear here. Ask nearly every aviation service sales person what the top deciding factor is for their customers when choosing an MRO for service and they will tell you Downtime. No one looks forward to having their aircraft down for inspection. Time is money and your aircraft needs to be available at all times. That is why your time requirement is one of our requirements. At Duncan Aviation, we continually examine our processes to find more efficient avenues to deliver landing gear faster. However, we will never sacrifice quality or safety for the sake of time. In 2015, our landing gear shop met quoted turn times a near perfect 98% of the time on scheduled, complete landing gear sets. In 2016, we are on track to improve that number even further thanks to a more efficient process and interactive calendar. When it comes to overhauling, inspecting, and repairing landing gear assemblies and subassemblies, we’ve been doing it since 1978. The shop started out modestly as a bench at the back of our main hangar but has since grown to a 6,000-square-foot facility equipped with an overhead crane, dedicated paint booth, and cure room. 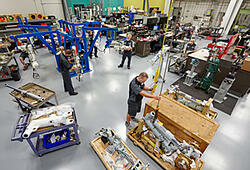 Are we the largest landing gear shop in the industry? Possibly not, but to the nearly 500 operators who rely upon us each year, we are big enough. With capabilities on more than 50 different make/model aircraft and 3,143 unique landing gear parts, we’re confident we’re big enough for you, too. By the very definition, a warranty is a promise of continued support and service even after the project is over. We believe so highly in our own work, that our warranties cover everything. Parts, labor, and not just our work, but the work of others...covered. I know what you’re thinking! How can Duncan Aviation possibly offer a warranty on work they didn’t perform? It’s simple. Through our experience, we’ve been able to identify high-failure parts and will take the extra time during overhaul to make sure those parts are able to last. We think we’ve done a pretty good job at it because our warranty claim rate in 2015 was less than 1%, 0.6% to be exact. Although price is likely not the most important factor in your buying decision, it still is an important one. That is why we offer three different pricing structures to fit your budget requirements. Firm Fixed. Before your gear gets to Duncan Aviation, you will know what you are paying. Firm Fixed guarantees one price with no bill-back, regardless of the condition of the gear. We have heard from several operators who chose a lower-cost provider that with additional billing based on the gear’s condition, their final invoice was higher than our Firm Fixed quote. NTE (Not To Exceed). With NTE, we will provide you with the maximum quote. Your final bill will not exceed that quote. It could even be less. There will be no additional billing that will drive the invoice over the NTE maximum price. There could be some exceptions to the above pricing structures of which you will need to be aware. These include additional customer requests, optional Service Bulletins, missing or abused parts, and replacement of life-limited parts and engineering fees, if required. Standard Pricing. Standard Pricing includes all labor required to perform the normal inspection or overhaul, and required parts. Any discrepancies found during the inspection that may require additional parts and labor, will be quoted over and above. Each pricing structure has its advantages. We will work with you to identify which makes sense for you. 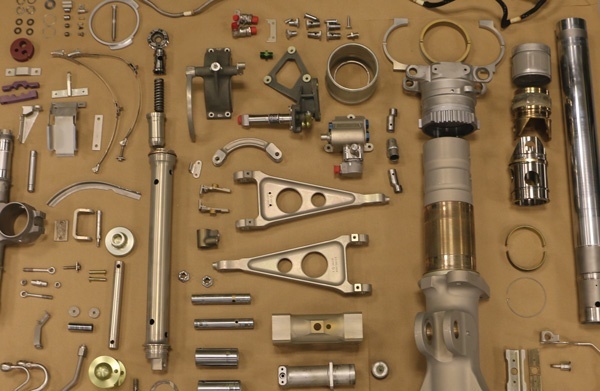 We realize that you have a lot of choices when it comes to servicing your landing gear. We know you want more than the minimum required. Seems like an easy decision really. Duncan Aviation.